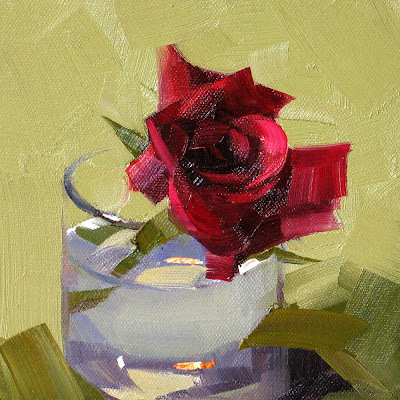 I did a couple of red rose paintings not long ago. I was using light background that time. I thought the rose was so dark. Using dark background might not work. Well somehow I still like dark background more. I think it enhances the light and color better. Today I got more red roses. I painted this one with dark background, and it turned out good I think. 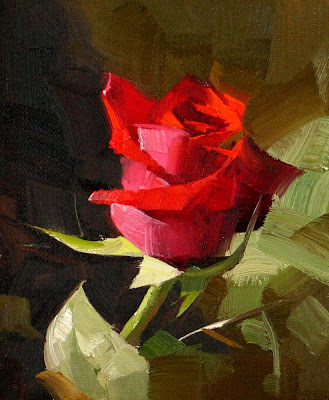 For now on, I will not shy away from red roses any more. 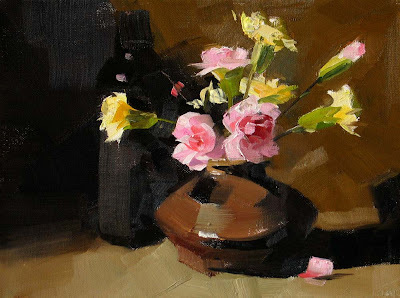 Having painted flowers for a while, I come back to my typical still life setup. 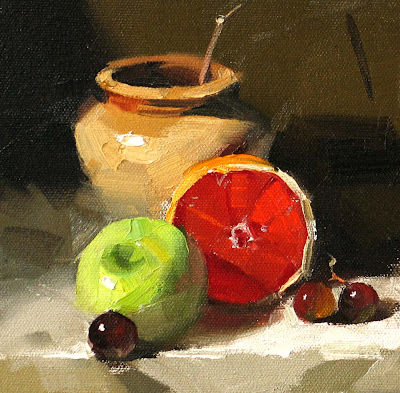 I really enjoy seeing the translucent red color of the grapefruit, especially in the casting shadow of the green apple. The photo does not show the dramatic effect enough. It is so juicy. It is so yummy to paint. This orange lily is so vibrant that it looks it is on fire. It warms me up in these cold days. Yesterday was the Chinese New Year -the year of the Ox. I wish all of you happy. My painting was very smooth as well. Everything was just right. No overwork. I like it. I did this gallery painting yesterday and I have submitted it to this years OPA National. So wish me luck. Now it is the season of roses. I am sorry that my eBay store is so empty at this moment. 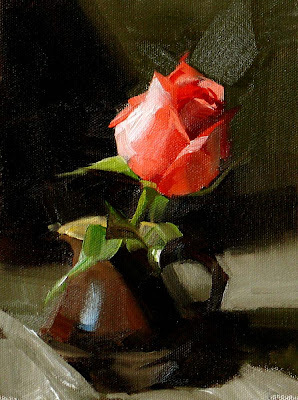 I will try my best to catch up and provide you rose paintings as much as I can. This is my second try painting a red rose. 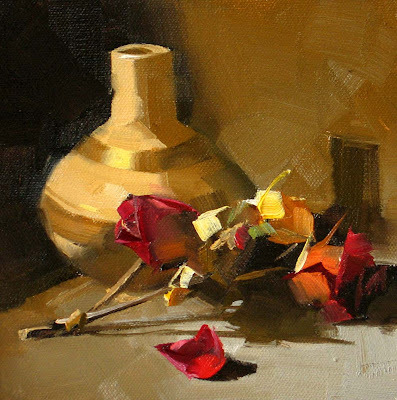 I was using the color "Permanent Rose" for my previous red rose painting, and I felt that color is a little too dark. For this one I tried "Cadmium Red Medium" It has shown definite improvement. It has lightened up the flower a lot. If it were a little rosier, it would be perfect. Do you have suggestions? Thanks in advance. This is the last demo painting at my workshop last weekend. I am sorry the image is a little fuzzy. I enjoy painting roses a lot. It used to be very hard to me. After painting quite a few of them I started feel more at ease now. 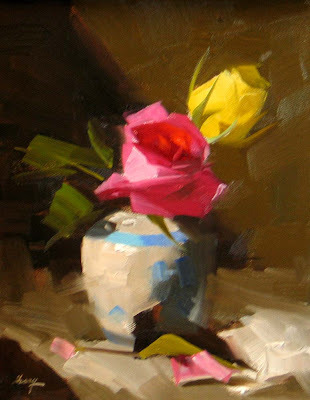 I think the rule of thumb on painting flowers is that you cannot copy it as a portrait. Using only adequate number of strokes on it. Prevent over work as much as possible. After my previous post, I have received many emails expressing concerns about my tire problems. I am really touched and thank you all very much for your caring words. 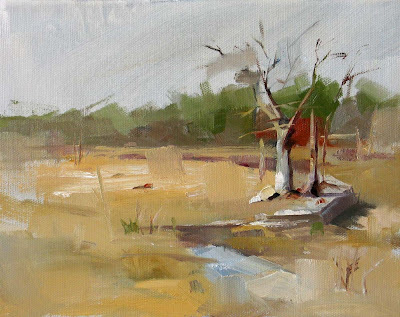 It seems every time when I post a plein air painting I will have a story to tell. 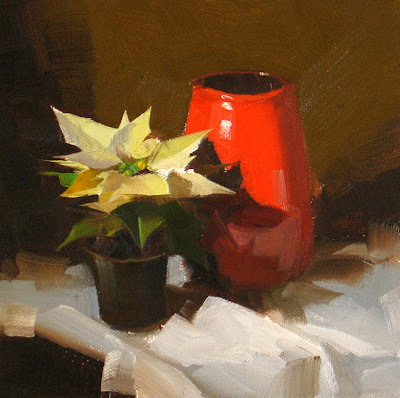 This painting is the second demo I did in my Houston workshop. The workshop was very successful and we all enjoyed it. After it was over, I packed my stuff and thanked my organizer Nancy, I jumped in my Honda started my trip back to Austin. The time was 5:30 Sunday afternoon. Well, I drove only about two blocks and I felt the car was a little shaky and also quite noisy. I pulled it over and checked. Oh boy! I had a flat tire. I saw a big screw right on. I had to turn around and went back to Nancy’s place. Nancy’s husband and son, Terry and Ben, helped me pumped more air into the tire and we went out and searched for a garage to fix the problem. Well, it was Sunday evening and nobody opens. I spent a pleasant evening with Nancy’s family, and I am very grateful for their hospitality. On Monday morning, Terry and I sent my car to the Discount Tires and I ended up to replaced two tires. I thought I was back to normal, but did not realize a bigger problem was waiting for me. About 50 miles away from Houston, I was cruising at 70 m/h on Hwy 290. Suddenly the car was shaking violently combined with a roaring noise. I clamped my hands on the steering wheel to prevent the car to be out of control. I managed to change two lanes and stop the car on the side of main traffic. After a minute or two for the adrenaline to subside, I came out of the car. O Lord! Behold. One of the tires, which had not been replaced an hour ago, had blown up. It was so incredible that I had two tire problems so close together in time. I was in the middle of nowhere; big semi trucks roaring passed me. It was very windy. I had to reload my staff in the trunk and got the tiny spare wheel out….. I limped quite a while and finally found an old shack. I asked directions and limped five more miles. I spent a small fortune to put another new tire on. For the rest of the trip, I was very cautious, felt the only tire having not been replaced might blow up any minute. Now I feel thankful to the nail on my first flat tire. I can’t imagine what would happen if I had the other tire blown up in the middle of last night. This is the first demo painting I did at my workshop in Houston. I want to express my sincere appreciation to Mrs. Nancy Pruden for organizing this workshop. I really treasure every opportunity of teaching. It feels so wonderful saying old friends and meeting new friends. I want to thank all the workshop attendees. I am really having fun here. I have painted many roses, but this is my first time I painted a red rose, if I remembered correctly. I usually like my center of focus brighter than its background to create a glowing effect. I think it would be very difficult to do that with red roses, so I used lighter background for this one. Picking up the right red color for the rose is another difficulty. 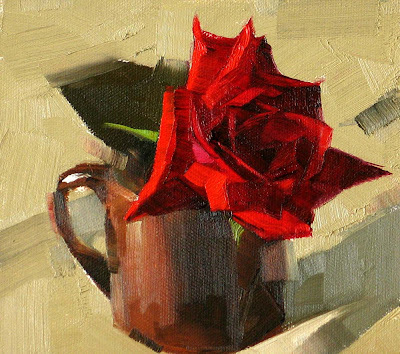 I will paint more red roses in the future and experiment with different types of reds. I am on my way to Houston after this post. 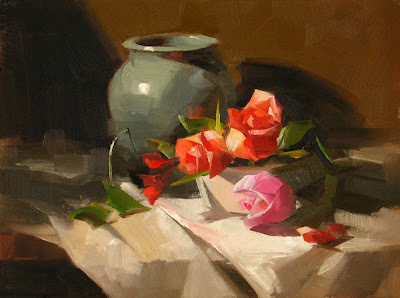 I will teach a workshop there and I will let you know how it turns out next week. I was sick for several days. My head was pounding and my hands were shaking. It took me a few days to finish this painting. I am all right now and life is back to normal. After last time we discuss about what brushes to use to painting larger paintings, I went to the local Jerry's Artarama and bought a couple of brushes for painting murals. They are about 2" wide and their quality is quite good. They do not lose hair during painting. I have used them for this painting and kind of like them. Life has left these flowers a long time ago, but their beauty has been frozen so they can go beyond the limit of the time. I think it is the mission of the artists too. We capture the glimpse of the world or a sparkle of the mind, we solidify that beauty and preserve it on canvas or bronze, and then we share it with the rest of the world beyond the limit of the time (theoretically). I was planned to teach only one workshop this year in Austin TX and it has been full. However, I still keep getting requests of taking my workshop. 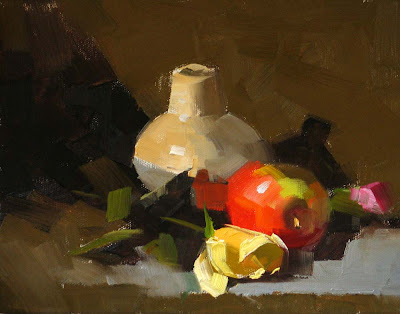 So I decided to offer the second 3-day still life workshop in Austin. The time will be on September 18 - 20. Please contact Karen Wilkerson at: karenwil@austin.rr.com for information and registration. P.S. I want to pass a notice from you workshop organizer Deborah at Cincinnati, OH: The workshop is full, however there are plenty of openings for my painting demonstration on Friday April 24, 2009, 7 – 9 PM at the Womans Art Club Cultural Center. Fee for the demonstration will be $25.00 advance reservation and $30.00 at the door. Please contact Deborah Ridgley: Dgrstudios@aol.com . The Holiday Season is over, but I still have this poinsettia. 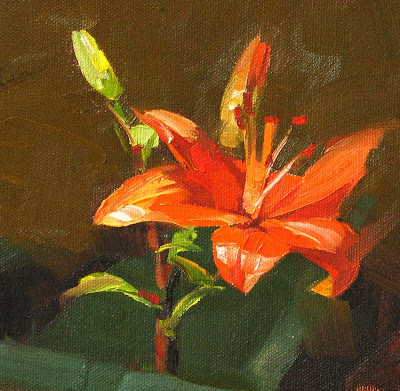 As a matter of fact, I did not know the name of this flower when I painted this painting. I have to google it before this post. Now I know why poinsettia is related to Christmas. I really like the legend. I can't believe it is January. Today's temperature is above 80 F here at Austin. It feels like summer. I went out and did this plein air painting. To do plein air, you want make sure you bring everything you need. I really learned the hard way. 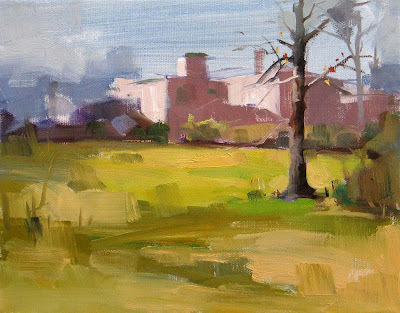 When I did my previous plein air, I forgot to bring my tripod. It wasn't too bad. I set my open box M on a picnic table. Well, today I went to the same park again. I remembered the tripod this time, but I found I did not bring my canvas. "Well that's it" I told myself. So I had to go home. After I got my canvas, I went back. I setup everything and started painting. Then I found I didn't bring my palette knife. I use it a lot to mix my colors. I was really frustrated, but I didn't want to go home again. I ended up like a man in the Stone Age. I found a piece of tree bark. That was my palette knife of the day. I hope you plein air painters do not like me.